When did American Academy of Pinecrest start? In 1971, American Academy of Pinecrest opened as a neighborhood school in the Southwest section of Miami, Florida. The home study program was introduced in 1976 and has earned an excellent reputation in the United States and throughout the world. Is the American Academy of Pinecrest diploma accepted in all states? I left high school before the tenth grade, can I enroll in American Academy of Pinecrest? All applications will be considered for enrollment regardless of the last grade completed - even if you've never attended high school before. Is the American Academy of Pinecrest a high school GED? No. American Academy of Pinecrest awards a fully accredited, private high school diploma. We strongly suggest that you contact the college/ university/ institute to verify acceptance of our high school diploma. What is the American Academy of Pinecrest, high school program like? You study in your home, independently, at your own speed. And there are no classes, no deadlines, and no pressure from classmates. It is the policy of American Academy of Pinecrest that a student cannot be dropped from the program for academic reasons. That's why we describe our program as "Failure-Proof". What courses are required to graduate with a high school diploma from home? American Academy of Pinecrest has the same basic required subjects as other private schools or public high schools. Transfer credits and your credit for experience will determine which courses and how many you take. How long will it take to earn my high school diploma? With American Academy of Pinecrest's accelerated high school diploma program, you can earn a fully accredited high school diploma in just 6 weeks. How do I receive my high school diploma? 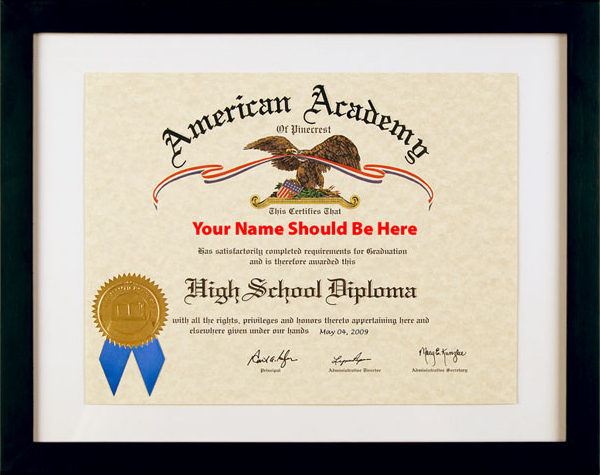 Your diploma is showcased in a beautiful display folder engraved with the American Academy of Pinecrest emblem. It is sent to you immediately upon receipt of your final payment and completion of your studies. Allow 2 weeks for delivery. You study in your home, at your own speed, when it is convenient for you. You work at your own pace. There’s no one to rush you or hold you back. While you work independently, you are never alone. Academic Advisors provide you one-on-one feedback and support. All study material has easy-to-read print. Each subject has one open-book multiple choice exam. Transfer credits and your credit for experience will determine which ones and how many exams you take. You may repeat an exam immediately, with specific help from your academic advisor to improve your study skill and grade, until you achieve a passing score. You will earn your high school diploma from the nationally accredited American Academy of Pinecrest. American Academy of Pinecrest is accredited by the National Association for the Legal Support of Alternative Schools (NALSAS), and Transworld Accrediting Commission International and meets all state requirements listed with the state of Florida Department of Education. You may use your diploma in all 50 states.